I spent almost the entire Australia day long weekend in bed with some kind of undiagnosed ’flu/virus/headache ailment. Although I did manage to get up and watch the first set of the men’s final of the Australian Open on Sunday night before collapsing back into bed, I spent the weekend with that sense of boredom and frustration of the world partying on around you while you are too ill to move. I suffer from migraines, so I’m used to being stuck in bed in a twilight zone while the world moves on, but there’s a familiarity about a migraine attack: a sense of light at the end of the tunnel, knowing that I will eventually feel well again. When I’m struck down with some undiagnosed ailment, I tend to spiral down into a paranoid hypochondria that perhaps this it: I’ll never feel well again, this headache is no ordinary headache but a sign of an aneurism or stroke or something else fatal such as meningitis. When you’re sick as a dog, there is always the question of what you can possibly eat and the usual thing that pops into my head during the dark moments when I think I’m at death’s door is… congee! If I just manage to eat some congee, I can cure myself. I first had congee many years ago when I was out on the town with some girlfriends and we stopped by a hole in the wall place in Chinatown for a late night supper before moving onto the next party. The grumpy old crone of a waitress firmly declined all our requests to order anything from the menu, insisting that what we girls needed to eat was Chinese porridge, very good, very tasty rice porridge. We didn’t think porridge sounded that appetising at 11 o’clock at night but our waitress was determined – that’s what we were going to be eating and so it was – we all ate the most enormous bowls of congee. Our waitress was right: it was very good and very tasty and just the thing to build the strength for another late night party. Congee is one of those miraculous foods of astonishing frugality, like the stone soup of folk tales. All you need is a tiny bit of rice, water and some salt and you can make a recuperative broth that, when you’re at death’s door, can make you feel you may make it through the night and live another day. Lots of countries have some version of rice porridge, such as the Indian khichri, but when I’m feeling poorly, I prefer the Chinese version with its bland base of rice broth that can be seasoned with accompaniments according to taste or whatever you’re up to eating. 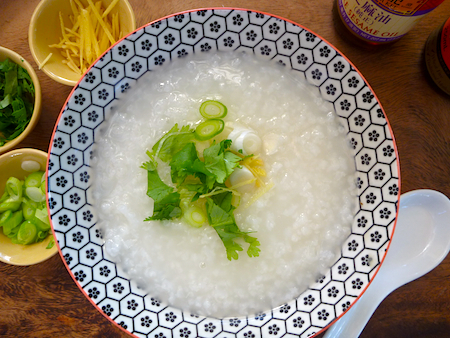 The recipe below is for a plain congee. If I have them around, I generally always add spring onions because I just love the flavour it gives the broth but, if your feeling very, very poorly, leave them out: the plain rice congee is probably as much as you can cope with. 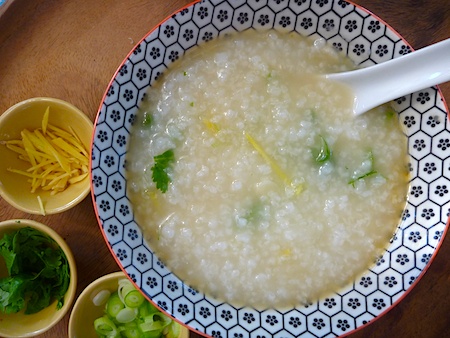 You can use some glutinous rice to make the congee thicker and soupier but it’s not essential – I generally just use what ever short grain rice I have on hand, which is usually risotto or Thai jasmine rice – and they both work pretty well. You can also use stock instead of water, and I usually stir fry some greens with ginger, add a pinch of salt and sugar and a dash of vinegar – and add these to the congee just before the end of the cooking time. 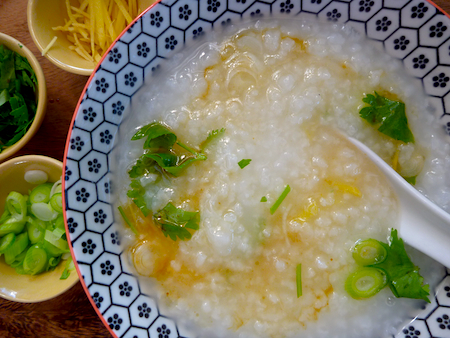 I’ve heard of some Chinese mothers putting a teaspoon of Marmite or Vegemite into the congee for that added dash of goodness for their ailing children, though personally, I have never tried either of these cure alls in congee. Wash and drain rice. Add rice and 2.4 litres of water or stock to a four-litre pot and slowly bring to the boil. Stir occasionally as rice comes to boil so that no grains of rice stick to the bottom. Turn heat to medium and boil gently for 10 minutes, stirring once or twice. Add salt and spring onions if using, bring to a simmer, cover pan and cook gently for 1¼ hours until rice has blossomed and melted into a soupy broth. Check occasionally and add more water if necessary. Serve with a selection of accompaniments and add according to personal taste – some traditional ones are white pepper, coriander, finely sliced shallots, soy sauce, boiled or pickled eggs, fermented tofu, chilli oil, sesame oil, chilli oil, pickles and vinegar. How about short grain brown rice-do you think that would work in this recipe? This looks like great comfort food, and I especially like the choices for toppings! Thanks for sharing! Yes you can make congee with brown rice but you have to cook it for a long time. I think it would be worthwhile soaking it overnight. I KNOW congee is good for you! I DO!!!! And when I am well and perhaps in Singapore or KL I do not mind picking it for breakfast! . . . If I felt poorly . . .hmm . . . perhaps I would pass – horses for courses!!! Yes each to their own when you’re feeling sick, but I love congee even when I’m not feeling ill.
Congee isn’t just good for when you are sick but delicious in its own right. I might have to make some of this on the weekend. Looks so comforting. I’m really looking forward to trying this, I’ve been so flat with the weather we’ve been having and I’m hopeful it will be a good replacement for chicken soup when I’m sick! Thanks for joining the link up again so lovely getting to share your wonderful recipes.